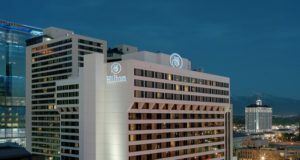 The 2018 IP Summit will be held at the Salt Lake City City Center Hilton Hotel (255 South West Temple, Salt Lake City, UT 84101). 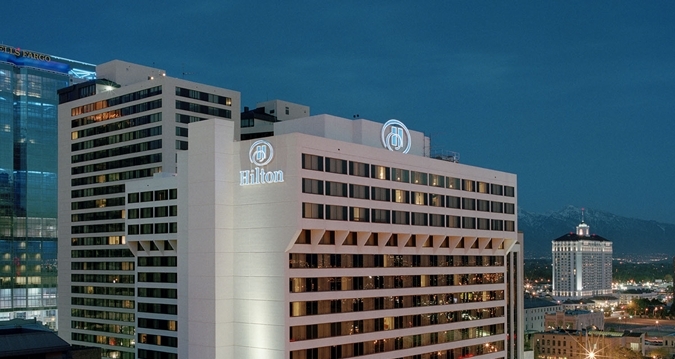 The Hilton is located in the downtown business district of Salt Lake City, within easy walking distance of many fine restaurants, shopping, and world-famous tourist attractions. DRIVING FROM SALT LAKE INTERNATIONAL AIRPORT (SLC): Follow signs for I-80 Eastbound(City Center). Take I-80 east . Exit at 600 South. Follow 600 South to West Temple (4 lights). Turn left on West Temple Hotel is 3 1/2 blocks on right. Travel Time: 10-15 minutes. Uber and Lyft operate from the airport and are usually the cheapest options. Rental cars are also available at the terminal. Alternatively, use TRAX Light Rail from the Airport and exit at Gallivan Plaza; hotel is located 1 block West of the station. DRIVING FROM THE SOUTH ON I-15: Exit I-15 at 600 South exit. Follow 600 South to West Temple. Turn left on West Temple. Hotel is 3 1/2 blocks on right. DRIVING FROM THE NORTH ON I-15: Exit I-15 at 400 South exit and take a left. Follow 400 South to West Temple. Turn left on West Temple. Hotel is 1 1/2 blocks on right. Driving FROM THE WEST ON I-80: Follow I-80 as it merges with I-15 Northbound. Exit I-80 / I-15 at 600 South exit. Follow 600 South to West Temple. Turn left on West Temple. Hotel is 3 1/2 blocks on right. Driving FROM THE EAST: From I-80 west (Wyoming) or from I-70 west (Colorado). Follow as it merges with I-15 Northbound. Exit I-80 / I-15 at 600 South exit. Follow 600 South to West Temple. Turn left on West Temple. Hotel is 3 1/2 blocks on right.